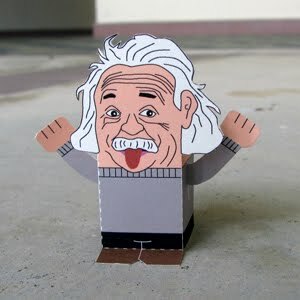 This paper people toy is the famous theoretical physicist Albert Einstein, the papercraft is designed by Toy a Day. Albert Einstein was a German theoretical physicist who developed the theory of general relativity, effecting a revolution in physics. For this achievement, Einstein is often regarded as the father of modern physics. Einstein is generally considered the most influential physicist of the 20th century. While best known for his mass–energy equivalence formula E = mc2, he received the 1921 Nobel Prize in Physics “for his services to theoretical physics, and especially for his discovery of the law of the photoelectric effect”. The latter was pivotal in establishing quantum theory within physics.